I can’t believe this is just the second day. We did SO much today I think it’s hard to put it all in words. First we got up late, jet lag is finally gone and we headed out on our day. The plan was to visit the Louvre Museum as it was a free day (first Sunday of every month). We ended up walking to the museum which was about 1/2 hour walk from the condo. Prior to getting there we stopped off at Brasserie for a couple of sandwhiches (in a bagette). MMM nothing like a bagette with brie and tomatoes. We got to the backside of the Museum and it was so impressive. Now this was just the backside, when we walked through a door way into a court yard and was floored away. Russ of course kept say, wait, and boy was he right. Walking through the court yard and entered the main court yard with the glass pryamid. Now for those who have never been here, the pyramid is the actually the enterance to the Louvre. Since it was a free day, the crowds were out in force! The place was SO busy I’m surprised the security was so light. At this point I was having a hard time with the crowds and we had to get out of there. 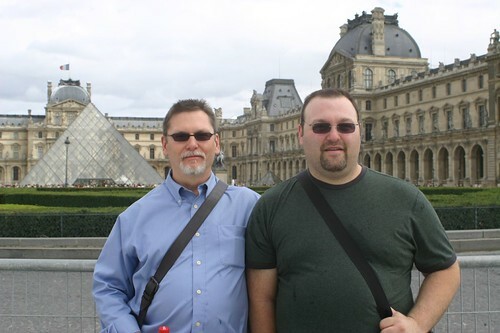 We ventured outside and got our picture taken in front of the Louvre. We started to walk through the Tuileries Gardens. Tons of people around, enjoying the nice Parisian weather. 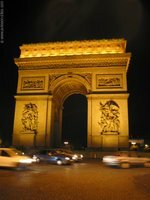 We continued our walk up to the Champs-Elyees towards the Arc de Triumph. We didn’t exactly hit the Arc as our feet were getting so TIRED from all the walking. We hopped on the Metro and went to see the famous Opera House. This is inspired the Phantom of the Opera. In true spirit, you had to pay to tour the Opera House (Russ remembers when this was free). The staircase was GRAND as grand as a staircases should be! The chandelliers were HUGE or as Russ likes to call them (earrings). Of course at this point my shirt was soaken wet from the humidity, but being a trouper I continued on. The reception area, the audience room was amazing to say the least!! We ended up taking a small break outside the Opera House and just enjoyed being there. We hopped back on the Metro and came home. Granted we tried to stop off to pick up something at the groccery store, but nothing is really open here in Paris on Sundays! We’ll have to wait until tomorrow for that. Tonight we dined at a fantastic restaurant known as The Gai Moulin. I had to go all out and ordered the Kangaroo for dinner. MMMMM Yummy!!! We did some more walking and returned home. Phew a HUGE Day and another one to happen again tomorrow!! WOW finally here in Paris! Had a short delay in Vancouver on our way to Toronto to join our flight to Paris. Overall the flights were very comfortable. we managed to at least get some sleep and felt alittle rested when we landed in Charles de Gaulle International Airport. Interesting note, you don’t have to grab your luggage before customs here. I thought that was interesting. Granted after having to fight our way through to our luggage carousel from what felt must have been a flight from somewhere in Africa where they were bringing anything and everything back (some I swear were rotting). Well we finally finished and headed back to shower. AHHH a shower after a 14 hour trip was well worth it. We got ready and headed out again. We walked around the Marais District. WOW the architecture here is amazing. I couldn’t get enough of it. 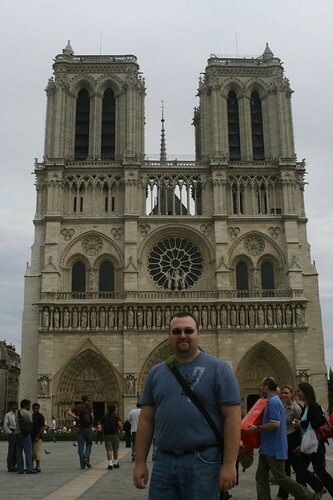 We walked down to Ile Saint-Louis and then to Notre Dame Cathedral. Such an amazing place. 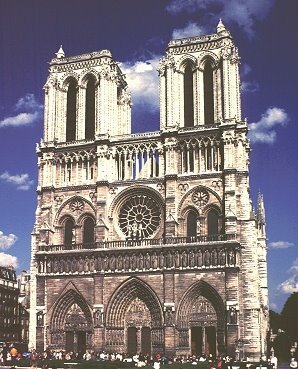 I was blown away by the gothic look of it all. I’ll have pictures posted on my flickr page soon enough. We ended up walking back to the condo but we pasted by some interesting shops and the Hotel De Ville. PHEW so much in so little time. Tomorrow we tend to head to the Louvre museum as supposedly it is free on the first Sunday of every month. Well we are now fully booked for Paris. 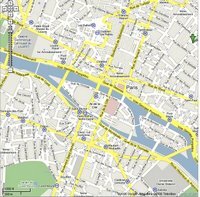 We will be staying in a studio condo in the centre of Paris known as the Marais (4th) District. 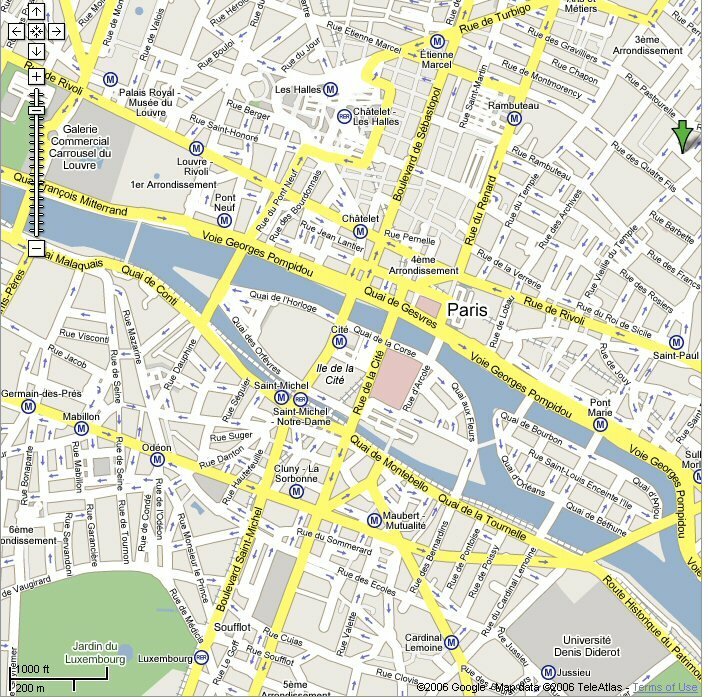 We will be about 1 km away from Notre Damn Cathedral and about 1.5 KM away from the Louvre museum. Not to mention 0.5 km from the Picasso museum. This is a city full of culture from what I can read up on. How’s this for class, you are free to enter any city owned museum, free to enter any museum if you are unemployed, and free if you are under 18 years of age! Now that is CLASS! I’ll try to keep everyone posted on my activities during the trip which is 10 days away! EEK! I’m Paris bound for September 1 – 14. I can’t wait to have this vacation start! I’ll be stopping in Toronto for a couple of hours lay over so to all my family who are reading this, expect a phone call at least!!!! Thanks again to my wonderful sister Gladys for getting these tickets for me!! Now we need to book a hotel. Anyone know of a good hotel in Paris?